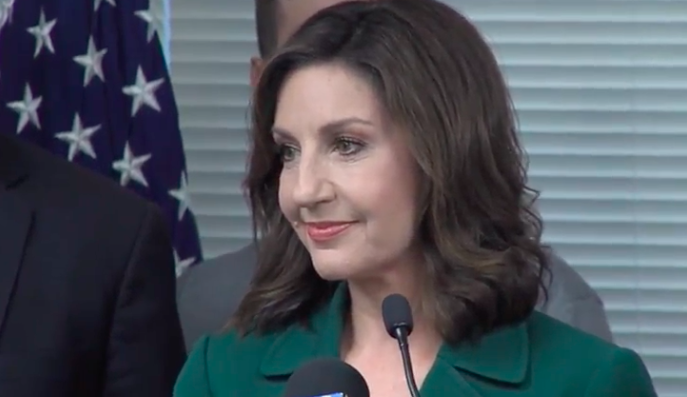 Superintendent of Public Instruction Joy Hofmeister takes questions from reporters Tuesday after criminal charges against her and four others were dismissed. Just as suddenly as they appeared in November, criminal charges against Oklahoma schools Superintendent Joy Hofmeister disappeared last week. And the reasons remain a mystery. At a news conference, surrounded by her attorney, family and supporters, Hofmeister appeared elated and relieved. She and four others no longer faced charges of conspiracy to circumvent campaign finance laws in Hofmeister’s 2014 bid for office. The charges were filed in November against Hofmeister; Robert “Fount” Holland, a political consultant; Stephanie Milligan, who ran Oklahomans for Public School Excellence, a social welfare nonprofit that purchased attack ads against then-superintendent Janet Barresi; Steven Crawford, former executive director of the Cooperative Council for Oklahoma School Administrators; and Lela Odom, then-director of the Oklahoma Education Association. Here are some answers to lingering questions about the case, and what’s next. Q: Why were the charges dismissed when they were? It’s unclear, but it could be related to a preliminary hearing that was scheduled to begin August 16. In a preliminary hearing, a judge determines whether there is probable cause that the defendant committed the crime and if the case should proceed. Holland’s attorney Ed Blau said neither he nor the other defense attorneys had received any police or investigative reports from Prater’s office. All they had was the same 28-page probable cause affidavit that had been released to the public when the charges were filed. The defense attorneys planned, as state law allows in preliminary hearings, to subpoena records and call as many witnesses as necessary to provide a full picture of the case, Blau said. Typically, defendants waive preliminary hearings or take a plea bargain. This preliminary hearing could have taken a week or even weeks, Blau said. Q: Could these charges, or other charges, be filed again? A: Oklahoma County District Attorney David Prater dropped the felony charges on all five defendants Tuesday “pending further investigation,” alluding that the charges could be refiled. Prater told the Tulsa World that “additional information has come to light…and investigators need to follow up.” He told the website NonDoc, “We’re not done. We’ve had information come to us over the last several months regarding one or more of the defendants that we need to follow up on before we take the case to preliminary hearing.” Prater did not return calls for comment Wednesday. Criminal charges alleging coordination are rare and very difficult for investigators to prove. Q: How will the dismissal affect Hofmeister’s political future? A: Hofmeister said she’ll seek a second term in 2018, and she’s begun fundraising (her re-election committee, Friends of Joy Hofmeister 2018, raised $18,210 through June 30; meanwhile a fund to help pay her legal expenses reported raising $75,600 during the same time frame.) So far, no one else has announced they will run for superintendent, and though there’s still time, Hofmeister will have several advantages, said Bill Shapard, of SoonerPoll. She’s an incumbent and a Republican. In 2014, she polled well with potential voters. “It remains to be seen whether her favorability will return or whether this cloud will continue to follow her,” Shapard said. He hasn’t polled likely voters on Hofmeister since 2014, but he plans to later this month. James Davenport, a political science professor at Rose State College, said Hofmeister seems to have a more positive relationship with educators and legislators, too. “She has worked really hard to develop a good working relationship with those people,” he said, adding that it bodes well for her reelection chances. Q: What does this mean for “dark money” groups and campaign finance heading into the 2018 election? A: Probably not much. Not only is coordination difficult to prove, states differ on what they consider illegal conduct, said Pete Quist, research director for the National Institute on Money in State Politics. Nationally, prosecutions are rare for campaign violations involving coordination with so-called “dark money” groups. (These are either political nonprofits that don’t have to disclose their donors or “super PACS” – political action committees – that can receive unlimited contributions and route political spending through nonprofits or “shell” companies, effectively concealing donors.) Rarer still are successful prosecutions. The U.S. Department of Justice prosecuted its first dark money coordination case in 2015, in which the campaign manager for a Virginia congressional candidate arranged the spending of PAC contributions against an opponent. Hofmeister’s case was the first such prosecution in Oklahoma. Attorney Blau bemoaned the lack of legal clarity on the issue. “There’s almost zero guidance from either the statutes or the case law in terms of what’s involved in collusion,” he said, adding that candidates and organizations don’t know what they can and can’t do. And independent expenditures continue to grow in Oklahoma. In 2014, the organization at the center of the charges, Oklahomans for Public School Excellence, spent $195,500, making it the biggest such spender that year, according to the National Center for Money in State Politics. Independent expenditures totaled $742,344 in 2014. By 2016, independent expenditures totaled $1,898,788, the largest amount to date. The election cycle featured a presidential election and high-profile ballot initiatives that attracted out-of-state money. However, 2008 and 2010 were only a few hundreds of thousands of dollars less. Q: Where are the defendants now? A: Hofmeister’s career seems unfazed by the charges. Holland, though, lost business; Hofmeister discontinued her contract with Holland’s firm A.H. Strategies sometime in the last year, as did two super PACs, reported The Oklahoman. Blau said his client had been inactive since the charges were filed but planned on returning to running political and issue campaigns. Milligan, who ran the social welfare nonprofit at issue, found work on Donald Trump’s campaign team and, in December, she married Chad Alexander, the political consultant whose 2014 arrest for cocaine possession gave investigators evidence used to file charges against Hofmeister and the four others. Crawford, of the Cooperative Council for Oklahoma School Administrators, and Odom, of the Oklahoma Education Association, each retired. Q: What happened to Oklahomans for Public School Excellence? A: The group is still legally in existence but doesn’t appear to have been active politically since the 2014 election. Its last filing with the Oklahoma Secretary of State was in May 2014, and its last filing with the IRS was in May 2016. Oklahomans for Public School Excellence was formed as a 501(c)(4) “social welfare” nonprofit, according to an affidavit filed in the criminal case. However, its most recent tax return filed, for 2015, indicates the organization is a 501(c)(3) nonprofit, a type that is not allowed to engage in political advocacy. It’s unclear whether that is an error or the nonprofit has reorganized itself. The 2015 return, which covered June 2015 through May 2016, reported the group brought in $205,621 in contributions and grants and spent $8,903 on producing and purchasing media – no further detail is provided – to raise awareness about public education in Oklahoma. It also donated $15,000 to the Regional Food Bank of Oklahoma and $5,000 to the Oklahoma Foundation for Excellence. Q: What happens to the money in Hofmeister’s legal defense fund? A: The Joy Hofmeister Defense Fund, a special fund under state ethics laws dedicated to her legal-defense costs, was created in February 2017. Special committees such as the defense fund must renew their registration with the state Ethics Commission each January until they file a final report that shows no money remains. The defense fund was active as of June 30 and had $9,028 left in the bank. The rest of the money went to the Riggs Abney law firm, where Hofmeister’s attorney, Gary Wood, works.